Members of the Fort Kent Community High School soccer team display the gold ball after beating Maranacook of Readfield 1-0 for the Class C state championship on Saturday at Hampden Academy. HAMPDEN, Maine — The five seniors on the Fort Kent High School girls soccer team had never advanced beyond the Class C North quarterfinal round until this season. And any frustration has now been washed away. Senior winger Jacalyn Pelletier scored a first-half goal and the defense, led by sophomore goalkeeper Lyndsay Ouellette and junior sweeper Amanda Thibeault, made it stand up as the Warriors beat Maranacook of Readfield 1-0 in a thriller on a wet Saturday morning at Hampden Academy. Coach Doug Cyr’s Warriors wound up 11-5-2 while winning Fort Kent’s first girls soccer state title. South champ Maranacook, playing in its first championship game, finished at 12-3-3. The Warriors had some good fortune. The Black Bears missed a second-half penalty kick and also couldn’t convert on a number of glorious chances over the final 20 minutes as they desperately besieged the Fort Kent penalty area. The game’s lone goal came with 14:31 left in the first half. A Black Bear tried to clear the ball but it struck a teammate and landed at the feet of Pelletier at the top of the penalty area. She calmly settled the ball and curled a left-footed strike into the upper far corner past Maranacook goalkeeper Skyeler Webb. The tireless and tenacious Thibeault was Fort Kent’s savior in the back as she consistently stopped attacks with her quickness and anticipation. The Warriors had their hands full with dynamic freshman striker Emily Harper, who exhibited exceptional dribbling ability, quickness and a potent left foot. “We usually play possession ball, but with her, I wanted to boot it because I didn’t want it at her feet,” said Thibeault. “We wanted to force her outside but, honestly, I think she did better going outside,” she added. With 27:13 remaining in the second half, Harper darted into the penalty area and was hauled down from behind, which resulted in a penalty kick. 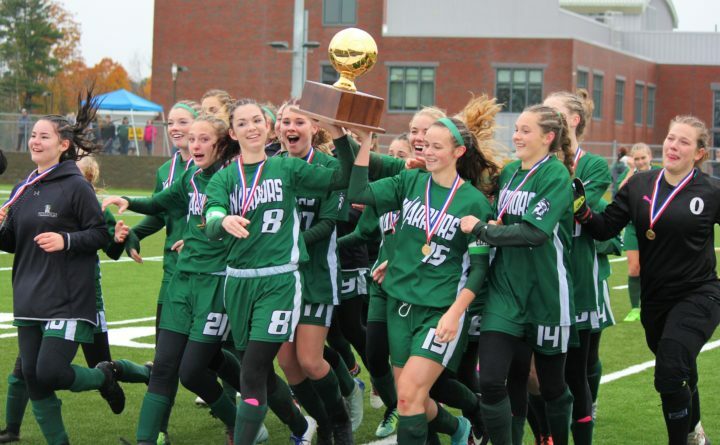 But standout senior midfielder Grace Despres, who converted from the penalty spot to give Maranacook a 4-3 win in PKs over Traip Academy of Kittery in the C South final, sailed her shot high over the crossbar. “Too much power,” said Despres. “That was a little stressful for me. I said a little prayer and then (after she missed) I said ‘Thank you’,” said Thibeault. “There is no one I would rather have in that situation,” said Maranacook coach Travis Magnusson. The surging Black Bears had several more chances. Six minutes later, Harper curled a 20-yard shot toward the far corner only to see Ouellette fully extend herself and push it away with both hands. “I thought it might have gone in. But she’s a real good goalie and she made a great save,” said Harper. “I knew I had to jump and do by best to get it. I wanted to win this. We’ve worked so hard for this and we got it,” said a sobbing Ouellette. A few minutes later, Harper made a scintillating 40-yard run, dribbling around several Warriors, before breaking in alone down the left side. She sizzled a 10-yard shot past the far post. “I had a hard angle on that shot,” said Harper. “She beat me. I thought we were done. She was going to tie it and we were going to overtime and penalty kicks,” said Thibeault. A nice diagonal pass from Grace Dwyer to Katie Ide presented Ide with a chance from the right wing but her shot sailed just high. Fort Kent’s Gabby Martin nearly sewed up the win with six minutes left with a powerful 17-yard shot from the top of the area. But Webb made a fingertip save. Ouellette finished with five saves on 12 shots while Webb had six stops on 11 shots. Despres and Harper said it was one of their best games of the season. “We played one of our better games. I expected us to score. We had a lot of opportunities but (Fort Kent) played really well,” said Harper. Defender Simone Martin and striker Gabby Martin each turned in strong performances for Fort Kent along with Ouellette and Thibeault while defender Evelyn St. Germain, Despres and Harper shone for Maranacook.